LOS ANGELES (Aug. 23) – A continued shortage of available homes on the market impeded California pending home sales in July, but pending sales were still higher from the previous year for the 15th straight month, CALIFORNIA ASSOCIATION OF REALTORS® (C.A.R.) reported today. C.A.R.’s Pending Home Sales Index (PHSI)* fell 4.2 percent from a revised 121.2 in June to 116.1 in July, based on signed contracts. Pending sales were up 2.8 percent from the 113.0 index recorded in July 2011. July marked the 15th straight month that pending sales were higher than the previous year, but July’s year-over-year increase was the smallest in the past year. Pending home sales are forward-looking indicators of future home sales activity, providing information on the future direction of the market. • The share of equity sales – or non-distressed property sales – compared with total sales continued to expand in July. The share of equity sales increased to 59.5 percent in July, up from 58 percent in June. Equity sales made up 52.4 percent of all sales in July 2011. 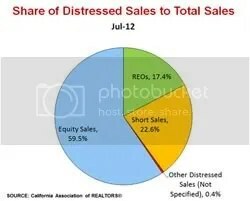 • The share of REO sales statewide shrank further, while the share of short sales increased. The combined share of all distressed property sales fell to 40.5 percent in July, down from 42 percent in June and down from 47.6 percent in July 2011. • The share of short sales increased in July to 22.6 percent, up from 21.4 percent in June and from 18.8 percent a year ago. • Of the distressed properties, the share of REO sales dwindled in July to 17.4 percent, down from 20.2 percent in June and 28.6 percent in July 2011. • The available supply of REOs for sale remained constricted in July, with the Unsold Inventory Index standing at a 1.5-month supply in July 2012, essentially unchanged from 1.4 months in June. The July Unsold Inventory Index for equity sales stood at 3.8 months and was 4.2 months for short sales. • Closed housing sales in July by sales type (equity, distressed). • Pending sales compared with closed sales. • Historical trend in the share of equity sales compared with distressed sales. • Housing supply of REOs, short sales, and equity sales in July. **Note: C.A.R.’s pending sales information is generated from a survey of more than 70 associations of REALTORS® and MLSs throughout the state. Pending home sales are forward-looking indicators of future home sales activity, offering solid information on future changes in the direction of the market. A sale is listed as pending after a seller has accepted a sales contract on a property. The majority of pending home sales usually becomes closed sales transactions one to two months later. The year 2008 was used as the benchmark for the Pending Homes Sales Index. An index of 100 is equal to the average level of contract activity during 2008. Leading the way…® in California real estate for more than 100 years, the CALIFORNIA ASSOCIATION OF REALTORS® (www.car.org) is one of the largest state trade organizations in the United States with 155,000 members dedicated to the advancement of professionalism in real estate. C.A.R. is headquartered in Los Angeles.